Alpine Caper Bush is a spiny, trailing, deciduous shrub. Twigs are velvet-hairy. Stipular thorns usually recurved, rarely spreading or straight, up to 6 mm long. Leaf-stalks are grooved, 0.5-1.5 cm long. Leaf-blades are oblong, elliptic, elliptic-ovate or elliptic-obovate, velvet-hairy to densely white-woolly especially when young, later velvet-hairy to becoming hairless, 2-4.2 x 1.5-3.2 cm, base usually nearly flat or rounded, tip blunt or tapering, rounded or retuse, sometimes pointed, with a short sharp point or spiny with a short sharp point, with mucro usually more than 0.5 mm and up to 0.9 mm long. Flowers are zygomorphic; sepals 1.3-2.4 cm long. Petals are 1.8-2.8 cm long, broadly obovate or oblong. Stamens are numerous with filaments pinkish or purplish in the upper part, up to 5 cm long, and anthers violet, about 2 mm long. Fruits are ovoid or spheroid 1.8-4.2 cm long. Alpine Caper Bush is found on rocky slopes, foothills, cliffs, steppic plains, dried river-beds, wastelands, roadsides, walls, becoming a weed in cultivations; on clay, limestone and gypsum, often in substrata rich in soluble salts. 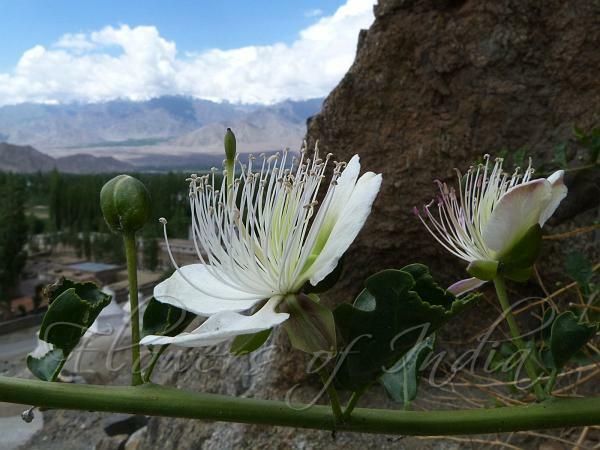 It is found from the Mediterranean region eastwards to central Asia, India, Himalayas and Nepal, at altitudes of 0-3600 m. Flowering: March-September. Identification credit: J.M. Garg Photographed in Leh, Ladakh & Spiti, Himachal Pradesh.